I took a short drive over to the museum yesterday and was struck anew by the high quality of its American holdings from the 18th and 19th century, as well as the intelligence and helpfulness of the labels elucidating those works. 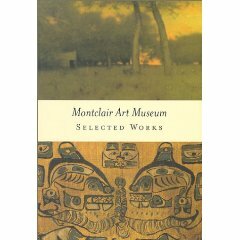 At the end of my visit, I stopped in at the bookstore to purchase a copy of the museum’s 2002 handbook, Montclair Art Museum: Selected Works. 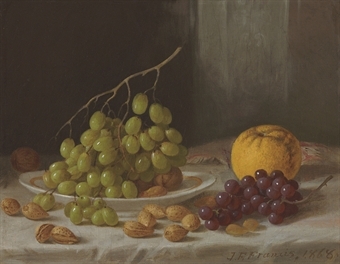 “Still Life with Fruit and Nuts” is a Peale-type dessert piece, which attracted a wide audience. With a soft application of paint, Francis distinguishes each morsel for its individual beauty. 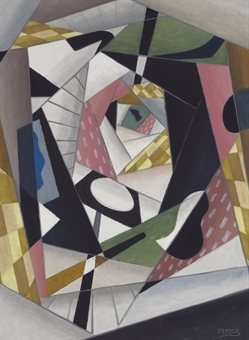 “Labyrinth” is a dynamic composition of strong but subtle colors, enlivened by the bold use of black and white. The centrifugal arrangement of the interlocking shapes and their gradual reduction in size toward the center create an illusion of depth. I still don’t know the identities of the Montclair castoffs to be included in three June sales at Christie’s. (Old Masters: 2 Montclair consignments; Interiors: 14; Books: 1; all will eventually be searchable on Christie’s site.) Nor have I gotten the list of costumes from Montclair to be sold by Augusta Auctions in New York on Wednesday. Although the museum’s director, Lora Urbanelli, told me last Wednesday that she would have someone send me the list of consignments “tomorrow” (that is, last Thursday), I have received nothing so far. My e-mailed request to Augusta Auctions was likewise unanswered. It appears that the sales are problematic not merely because their proceeds will do double duty (to be used not only for art purchases but also to augment the total endowment, satisfying requirements related to the museum’s bond issue). 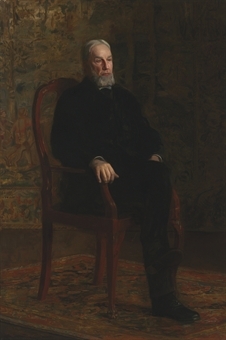 Montclair, it now appears, also deserves scrutiny for jettisoning three works that a few years ago were deemed by the museum itself to be important enough to the collection for inclusion among only about 200 objects chosen for the handbook (at a time when its total holdings numbered about 15,000). Eakins [here, here and, most importantly, here]. No doubt this is being justified as removing works not in line with the Hirshhorn’s role as the “modern and contemporary” branch of the Smithsonian. But in any sane world they would simply be transferred to the Smithsonian American Art Museum, which, to my recollection, isn’t exactly drowning in Eakins masterworks. attic,” located in the nation’s capital, has no room for works by arguably the nation’s greatest painter.